Who's the French journaliste at ease reporting on everything from pesticides in food and France's next presidential election, to decorating a Parisian apartment on a budget and American Thanksgiving? Hint: You've seen one of her reports on M6 100% Mag here. She's also working for France 2 on a program that profiles the lives of interesting Parisians. Sounds like a perfect gig for a woman who is oh-so Parisian herself! Please say bonjour to Clémence, the journalist Les Moms became friends with while filming Thanksgiving dinner for M6 TV. Enjoy learning more about this super-sympa Parisienne! Favorite French writers/singer/actor: I'd say my latest very favorite book is "La Délicatesseé by David Foekinos. Take it with you to the beach this summer: easy to read and very touching! Je parlerais plutôt de mon dernier petit coup de cœur : « La délicatesse » de David Foekinos. Je vous le conseille pour la plage cet été : facile à lire et très touchant ! Singer: The artist who I listened non-stop to last winter: Yael Naim. A mix of poetry and generosity on stage. She doesn't sing to be star, but to pass peaceful and tolerant messages. Yael is my Dalai Lama! Chanteuse : celle que j’ai écouté en boucle cet hiver : Yael Naim. Un concentré de poésie et de générosité sur scène. Elle ne chante pas pour faire la belle mais pour faire passer des messages de paix et de tolérance. Yael c’est mon dalai lama ! Actor : La Mom in Paris ! Un duo époustouflant de franco-américaines repérées par Coppola dès leur premier film « Thanksgiving » sur M6. J’attends avec impatience leur prochain movie ! Mariages Frères or Ladurée? Ladurée : The orange flower macarons ....to die for. Franck & Fils or Le Bon Marche? Without a doubt Le Bon Marché: more choice and the neighborhood isn't depressing! Sans hésiter Le Bon marché : plus de choix et quartier tellement moins déprimant ! Favorite clothing boutique in Paris? Matières à Réflexion on the Rue de Poitou in the Marais. A little gem in an old butcher's shop managed by a very cute young couple. The concept is great: they make handbags from old leather jackets that they've found at flea markets! One can also stop by their shop with an old leather coat and presto, they'll make it into a super custom made bag. They also have a fabulous selection of undiscovered clothing and jewelry designers. Run, don't walk! « Matières à réflexion » rue de Poitou dans le Marais. Un petit bijou de boutique dans une ancienne boucherie tenue par un jeune couple very cute. Le concept est génial : ils fabriquent à la main des sacs à partir de vestes en cuir vintage qu’ils ont chinées ! On peut aussi venir avec un vieux manteau en cuir et hop, ils en font un super sac sur commande. Ils ont aussi une sélection géniale de petits créateurs de vêtements et bijoux. Foncez ! Why do you love Paris? I'm still looking... but haven't found a city more beautiful than Paris! Je cherche toujours…mais je n’ai pas encore trouvé plus belle ville que Paris ! Favorite restaurant in Paris? Taeko, a little Japanese restaurant at the Marché des Enfants Rouges in the Marais. There are traditional Japanese dishes to be savored, real food! Taeko, un petit resto japonais tenus par des japonais (et non des chinois !) au Marché des Enfants Rouges dans le Marais. On y savoure que des plats traditionnels japonais, de la vraie cuisine ! Left Bank or Right Bank? To live : Right Bank. To love : Left Bank, in the Musée Rodin garden ! Et j’aime aller régulièrement sur le blog « FUBIZ, a daily dose of inspiration » : tout est dit dans le titre ! Everything is said in the title! Who's hotter - Nicolas Sarkozy or François Hollande? You are really spoiled in your country. Obama is my #1. Franchement vous êtes plus gâtées chez vous. Obama c’est mon top 1. Macarons or cupcakes? Sorry, macarons ! Espresso or café crème? I love George Clooney, but he doesn't measure up to a good caffé latte. It's impossible to find a café in Paris that serves a latte worthy of the name (even at Starbucks). I'm desperately looking for a latte that leaves a creamy little mustache...if you know THE place, let me know. J’adore Georges Clooney mais il n’arrive pas à la cheville d’un bon café latte. Impossible de trouver un café à Paris qui serve un latte digne de ce nom (même au Starbuck ;-) Je cherche désespérément un caffe late avec un chapeau de mousse onctueuse qui laisse des moustaches… si vous avez trouvé « THE place », merci de me le signaler. Le ski or St. Tropez? The sea...far, far away from St. Tropez! La mer…mais loin, très loin de Saint-Tropez ! Book or Kindle? What's a kindle? C’est quoi kindle ? Vin rouge or vin blanc? Red, a fresh little Brouilly! Rouge, un bon petit brouilly bien frais ! Le Figaro or Le Monde? Both depending on my mood. Les deux selon l’humeur du jour. 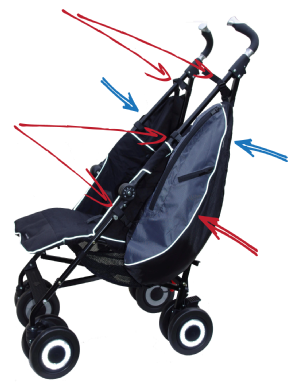 How many of you have been embarrassed in public when your stroller tipped over from the weight of the baby and shopping bags attached to the stroller's handle bars? Has that happened to you a hundred times like it's happened to La Mom? Trop frustrant. Hamster Buggy Bags is the solution ! Hamster Bags attach to the sides of the stroller to distribute weight evenly - no more embarrassing tip-overs. La Mom tested this bag for a month and all I can say is that it's a great invention - practical and stylish! To celebrate Hamster's imminent arrival in France, the company is giving away FIVE bags to five fans of La Mom's blog! Giveaway open to readers residing in France (bags will be mailed to French addresses from Hamster Bags UK). To enter, all you have to do is leave a comment. To double your chances, 'Like' La Mom's Facebook page. Winners will be announced on the next blog post. Bonne chance. Love the hamster pouches. I'm always red-faced and stuggling, instead of glamourously nipping back from the shops! Would love to enter with a French address! for my cousins grandson please this one! 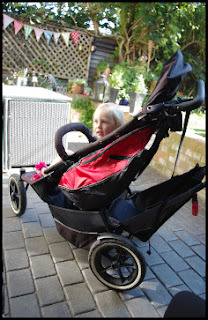 And I thought my stroller falling over was because I bring too much Stuff with! PLEASE NO MORE EMBARRASING TIP-OVERS in les rues de Paris!!! I love this idea! We had a recent tip over that was more than a little embarrassing! Great idea. The greatest bulevard in Paris! Oh, please, pick me for this!!! I nearly sent my infant catapulting through the aisles of the IKEA in Bordeaux a few weeks ago due to a bag mishap. Tres embarrassing. This was a great profile! I seriously considered naming the above-referenced infant Clemence, it is such a beautiful, classic name.